EUROPE: Recent project updates from the Hohe See project in Germany, Dong Energy's Gode Wind site and the 714MW East Anglia One project. Turbine supply: Siemens will supply 71 SWT-7.0-154 turbines and monopile foundations to EnBW's 497MW Hohe See project. It is the first turbines plus foundations contract to be awarded in the German offshore wind market. Inter-arrays installed: CT Offshore has completed installation of all 97 inter-array cables at Dong Energy's Gode Wind. Located in the North Sea, the 582MW development is Germany's largest offshore wind project to date. 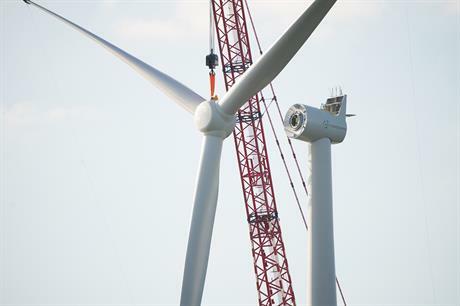 Turbines completed: All 48 Siemens SWT-3.0-108 3MW turbines have been installed at Westermeerwind, marking the completion of construction at the 144MW project. Port selection: ScottishPower Renewables' has chosen Peel Ports Great Yarmouth as the construction and installation base for East Anglia One. Up to £5m (€6.5m) will be invested at the Norfolk port, in order that it is ready to begin supporting construction work in 2018. The 714MW East Anglia One project is planned for a site in the North Sea. The first of its 102 turbines will be installed by 2019 and the project should be fully operational by 2020.